If you send out zipped attachments that could contain contentious files such as .bat and .exe files, or you attach such files directly, you could end up having them blocked by email filters that look for such things. The example on the right is what you should not do as html can contain virtually anything that will run with local privileges unless you do something about it and, the .doc file could be riddled with viruses. Ideally, if it is text that you want to send, you should have it inline so that it is easier for the recipient to quote - if you want to make sure that they cannot claim that you sent something that you didn't, all you have to do is to sign it with a public key cryptography program such as PGP or GPG. 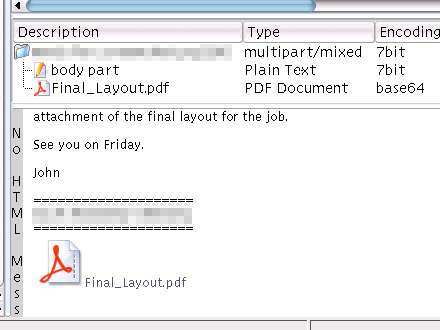 If layout is central to the purpose of your mail, a fairly good way of achieving this is to use a PDF file as the export. All good, modern word processors have PDF as an export file option so there shouldn't be any problem with getting people to see it the way that it should be seen. As for the contents of .zip files, you can either encrypt the file (and send the key in the body text of the mail - remember that you weren't bothered about keeping things secret in the first place or this problem would never have arisen) so that the recipient can open it but the spam filter cannot see inside the file. I have been getting many visitors to my web site that have used missing boot.ini or a similar phrase in the search engine. There is a simple way of reinstating the boot.ini file (which should be in the root of the first hard drive's first partition, ie its full path is C:\boot.ini or, /mnt/hda1/boot.ini on a Linux system which we shall come to in a little while) if you have a KNOPPIX CD. Insert the KNOPPIX CD and boot the machine. In KDE, click on the hda1 icon and when Konqueror has opened up, right click on the same icon and select action and then change the write status of the partition. If your boot.ini file exists, click on it (which will open it up in KWrite) and then, still in Konqueror, right-click on it and change its permissions so that it can be written to. If your boot.ini file does not exist, open up KWrite. Once you have it looking okay, save it or, if you are writing a new one, save the file as boot.ini on your hda1 partition (Windows C: drive). Next, shut down KNOPPIX and remove the CDR (it will tell you when you can do this) and then re-boot. It should all now work. Here is a link to Wilf's animated icon (Earth.ani) from this month's HelpDesk. Suite: OpenOffice.org is a suite of very capable office programs providing a word processor, spreadsheet, vector drawing program, presentation program and so on. They are a direct replacement for the Microsoft office programs and will even load and edit (and save if you think you should) your legacy MS proprietary format files (.doc and so on). The only gap in the suite at the moment is a database program and if you want one of those, you can opt for the Sun Microsystems version of the programs. If you are not bothered about writing your own databases, you can get it all - fully functional - for free. License: Licensing for the normal user means that you can have as many copies as you like at no cost. This means that you can have several copies at work and, if you want to take your work home with you, you can have a copy or two (or three and so on) there as well, totally legally. No worries about extra copies installed: This has the effect that there will be nobody threatening to sue you if you install an unregistered copy on your home machine and you can have as many copies at work without anybody worrying about a knock on the door or a letter from someone who wants some money. Licensing not an issue: Therefore, licensing is not an issue which has the knock-on effect that you do not need to manage licenses so that gets rid of all of those silly programs that make money out of you having to pay money. 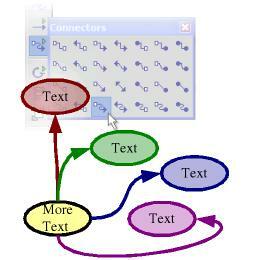 A mind map is a graphical representation of a set of organised thought processes. It is a very good way of analysing a problem and discovering what needs special attention and resources. Some applications of mind maps include: programming; moving house; going on holiday; installing a network; setting up a company; and, so on. I've used them for many years and I have found that a good way of generating them on paper is to put the object of the exercise in a box in the middle of the page and then ask questions that are relevant of it such as which, what, where, who, why, how, when. Not all of these will be applicable and once you have started, you might find that one you have left out becomes important but that is just where the flexibility of it all comes into play. If you do this on paper, you will have the advantage that you can work on it in places that you might never take your computer. However, paper has limitations - especially when it comes to flexibility when editing - on a computer with a program that is up to the job (such as OpenOffice.org's presentation or vector drawing program), it is easy to highlight areas and move them around, knowing that all of the thought links will remain intact. If you click on the image above, you will see a full-sized version in a new browser window. It is a hypothetical holiday, just to demonstrate how mind mapping on a computer works. From it, you will be able to see how to generate one on a piece of paper but this is how to create a flexible, editable one on a computer. If you have OpenOffice.org installed on your computer, you can open the file here. Thought Blobs: You will see from the image above or from the file that you have opened that the obvious starting place is to draw a filled rectangle (you can use an empty rectangle if you like but why not start off with colour coding?). If you double-click on the box, you can add text to it, changing the font properties (typeface, bold, colour and so on) as you wish. In this central box, put the name of the project - it will be the only thing with corners on the final sheet so it will be fairly easy to spot and you can tell one sheet from another quite easily if you put the project title in the central box. Next, you can create a number of filled ellipses, and put your text in there for your basic questions. At this stage, it is easier to colour code the ellipses as this will make following the thoughts easier although you do not have to do this if you don't want. Now that you have colour coded ellipses with your text in, it is easy to work your way along a branch, noting your thoughts in a logical manner. The easiest way that I have found to do this is to click on the ellipse that will be the source of the thought (so that you get the right colour and any other properties), press [Ctrl][C] to copy it then [Ctrl][V] to paste it, then move it to where you want and type in your text. Whilst this takes a little longer than doing it with a pencil and paper, the advantages will soon manifest themselves. To make another entry on the same train of thought, just press [Ctrl][V] and drag that new box - you only need to copy when you are changing your thought path. If you hover the mouse over the main part of the first ellipse, a dotted box will appear surrounding the whole shape. If you press the mouse button now, the start of the link will appear from the most appropriate of the NSEW positions for where it has to link to. If you hover the mouse over one of the NSEW positions, a small box will appear. Clicking now will make the start of the link appear only from that position. The same goes for the destination of the link. If it is over the larger part of the shape, it will attach itself to the most appropriate part - you can see how the link will go from the way that it is previewed. Again, if you use just one of the NSEW positions for the destination, it will only link to that one - again, previewed. Note that whatever you use to start your line, you still have a choice over how you attach the end of it thus, you can have a line from any position on the starting shape and specify the end as, say, the north position. When you move one of the shapes around, the links will adjust themselves with the unspecified one choosing the most appropriate place to link. If you want to move the whole mind map to a slightly different place, you can just put the mouse in one corner and drag it to the diametrically opposite corner to highlight the whole page and then drag the highlighted objects (along with their links) to wherever you need them to be. However, if you want to move just a portion of them - say, to make way for another idea you have just had - you can just highlight the ones you need to move and drag them. With OpenOffice.org, the links will stay linked and any that are changed will adjust themselves accordingly. In the image, you can see the orange coloured thoughts have been highlighted and their outlines indicate where they are being moved to - you can see how the links within the move stay the same but the one that bridges the moved ideas with the static ones adjusts its position automatically. If you need to distribute your thoughts, you can export them as PDF files if you want to be truly cross-platform. Like all good office programs, PDF export is native to OpenOffice.org although, if you have OpenOffice.org on more than one machine, you can of course, distribute your files in the OpenOffice.org open standards format.